Council planners are to make a site visit before a final decision on plans to quarry near an ancient monument knows as the Stonehenge of the north. Tarmac has applied to quarry sand and gravel at Ladybridge Farm in North Yorkshire, near Thornborough Henges. If approved, campaigners fear the work may help destroy clues about why the 5,000-year-old earthworks were built. 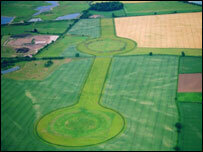 The company said it believed the land could accommodate both quarrying and conservation of the henges, near Ripon. Local campaign group Timewatch, which has collected a petition of more than 1,500 signatures against the plans, said the quarry would contribute to the permanent loss of nationally important archaeology. US-based conservation group the Landmarks Foundation has also weighed into the debate, describing the quarry proposals as a tragedy. In a statement, the company said the actual henges were under no threat from quarrying because of their status as protected ancient monuments. "Tarmac is continuing to play an active and supportive part in consultation on the future conservation of the monuments and adjoining area," a spokesman said. Members of the North Yorkshire County Council planning board will visit the site in August before holding a special meeting to discuss the application on 20 September.